At the start of the each year, I always take the time to look back on the year we left behind. Last year, one of my most memorable experiences was Oracle OpenWorld in San Francisco. The event has always been an overwhelming experience, but this year it seemed even more so. I have never experienced such an amount of announcements and innovations, varying in importance and readiness, and all more or less related to the cloud. A massive technology push to the cloud, a ‘cloud overload’. 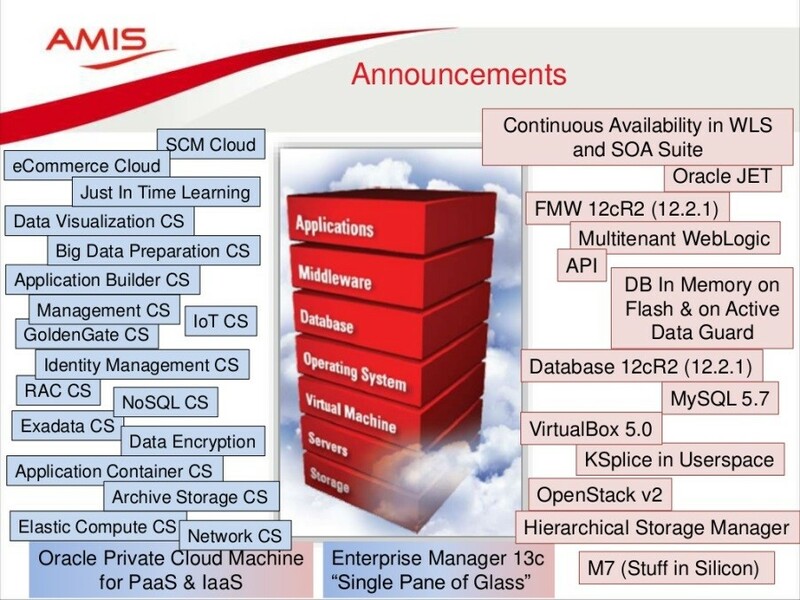 That could be the management summary of Oracle Open World 2015 (OOW15). 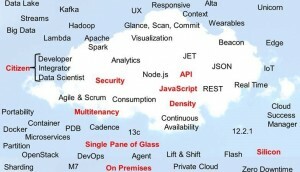 Oracle as software vendor is evolving to a cloud service provider. The force is strong. All customers are looking for directions and answers when it comes to what to do with their legacy systems and new projects. They want to be more competitive in their lines of business. And Oracle, along with other companies, clearly thinks that these answers can be found ‘in the cloud’: Using a private, public or hybrid cloud will result in cost savings, agility and speediness in deployment. What was it that Oracle communicated to the world on OOW15? This post is an attempt to unravel the Oracle roadmap and what that means for the customer. It is however a bit vague what Mark Hurd means by ‘cloud’ (presumed to be public cloud) or ‘on premises’ (local datacenter, legacy and/or private cloud). The direction is quite clear: on premises is old school and most announcements are directly related to these statements, perhaps leaving a lot of the existing on premises customers somewhat abandoned. There is an understandable reluctance in the market to move the production environment and data to the public cloud. Oracle is desperately trying to ease the pain of going to the public cloud and wants to gain trust in the areas of life cycle management, security, availability, flexibility, integration and portability of applications. A lot of Oracle products will also be available in the cloud, as a service. That is wonderful news, sinces customers are mostly interested in functionality and not in products. However, Oracle also has to provide for release-management of the on premises (downloadable) software. That means there is a challenge for Oracle in synchronizing the releases of the cloud- and the downloadable software. Oracle decided that they will release new software versions on Oracle Cloud first and on-premises later, with very short release cycles. Patches are excluded though. This may result in better software on-premises. When a development environment is located in a private or public cloud and the production environment is on premises, you will have to synchronise the production-release with the development and testing environment in the cloud. The rhythm will be dictated by the Oracle cloud. The multitenancy functionality of the Oracle database will be improved in isolation, on-line portability and fault-tolerance. Oracle weblogic also will have a multitenancy option to move your complete Weblogic application. Introduction of a Private Cloud Machine on premises, which will have the same Cloud software as the Oracle Cloud, with a tight – safe – connection to the public cloud. This machine will be administered by Oracle by the way. Collaborating with open-source software as Docker and Puppet for easier and predictable deployments and portability. A new chip, the M7, with build-in security, which is inherited by all the software on top of it. It is only available for the Solaris machine-range which are not used in the Oracle Cloud, but it is a new technique to keep an eye on. The data in the Oracle cloud database (transported and at rest) is always encrypted, so the Oracle engineers in the Oracle Cloud are not able to read the customer’s data. There is a possibility to keep the encryption key locally while the database is in the Oracle Cloud. Log- and trace files are not mentioned in the scope at the moment. Software in the public cloud should be easy-to-use and Oracle has made a lot of progress in that area over the last years. The look and feel of the front-end is more consistent throughout the software stack , and the cloud solutions are more integrated with eachother and other services like Office 365. It is based on three high level objectives: simplicity, mobility and extensibility. Oracle is clearly aiming at the so-called ‘citizen developers’ or ‘citizen data scientist’, the non-IT people who are able to play with the functionality until the complexity-level forces them to hand it over to the IT-department. A great example is the product Mobile Application Accelerator (MAX), which allows building mobile applications without coding by non-technical personnel . Quite a tactical commercial move from Oracle. Much effort has been put into the graphical support of showing analytical results. For example in the Visualization Cloud Server and the Oracle Management Cloud. You may be wondering: is there no news at all about the legacy, the on premises area? Well, the most visited stand on the demo-grounds at Oracle OpenWorld was the one with good old Oracle Forms. A new version, 12c, has been announced and that is a clear sign that Forms will be supported in the future. It is not ‘dead’ yet. It will get the same status as the OpenVMS operating system: It is a dead end technology, but as a lot of large customers are still using it and are depending on it, Oracle has an obligation to support this technology. The new Application Builder Cloud Service, based on popular open source frameworks, can change the way that new and existing stuff will be developed. The new version of the Oracle database has a lot of new functionality meant for portability, performance (also in combination with Exadata), and an exciting new feature regarding horizontal scalability and partitioning: sharding. With this technology you can get more control of where the data geographical resides. Is it possible to exchange your on-premises licenses for cloud credits? No it is not. But know that a lot of things are negotiable when Oracle thinks there is a commercial potential. One of the products that has been very prominent throughout a lot of sessions and that was more or less inescapable is Oracle Enterprise Manager. It is the central tool to monitor, analyze, deploy and just administer your environments, whether these environments are in the cloud or not. 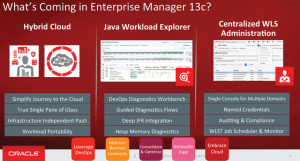 The new version, 13C, is more integrated, has a more consistent look and feel is better equipped for lifecycle management. Another tool that has been introduced is the Oracle Management Cloud. It is designed for monitoring and analyzing your on-premise application. 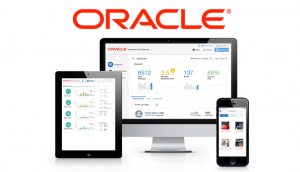 Quite an impressive tool that embodies the easy of use, look-and-feel, brilliant analytics, graphical support and the focus on functionality of the new Oracle future. With such an overwhelming number of cloud offerings, it is near to impossible to easily decide what is useful for your company, what kind of advantages it will bring and how to incorporate that in your current environment. My advise: stay well informed, invite Oracle partners for clarifying the Oracle Cloud. And my best advice: get started by free trials or with a small proof of concept to get ahead of cloud opportunities. To conclude, remember this quote: “The Cloud introduces new opportunities for those bold enough to step forward – and threats for those who are not.”. Truth is, many people will still trust their own infrastructure, regardless of advancement in cloud technology. Security, privacy and full control is very important to most corporations.